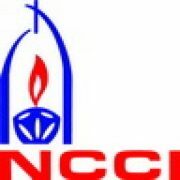 NCCI | An Open Letter from Bishop Most Revd Thomas K. Oommen (Moderator, Church of South India) to the Fellow Citizens of India. Why this Letter? : The Church of South India, which is the second largest Church in India with more than 4.5 Million members, most of them being dalits, adivasis, poor farmers and fisher folks, prays during every worship service, “Lord we pray that it may please you to guide with your pure and peace-loving wisdom those who bear authority in the affairs of humankind, especially the President of the Indian Republic, the Prime Minister, the Governor of our State, the Chief Minister and all those who serve in the Government that we and all people may be governed with justice and honour.” This shows how deeply this Church longs for a nation that is ruled in justice and peace. However, over the past few years, especially during the last four years, we are extremely alarmed at the way our nation is being ruled by Government at the Centre. 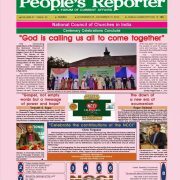 As a citizen of India and as the head of an Indian Church, which belongs to a minority religion, with the majority of its members belonging to the minority communities, I hereby share the fear my people have under the rule of a Government that has become a nightmare to the poor and the minorities in India. Discounting the Preamble: Under the regime of right-wing fundamentalist forces, which is completing four years, the poor and the minorities in India seem to be under threat. After four years of their rule, it is not only that they have not fulfilled their poll promises like ‘sab ka saath; sabka vikas’, bringing back black money, ensuring security of women, paying support price of 1½ times their input cost to farmers, creation of 20 million jobs every year for youth, setting up an effective lokpal bill and many more, but also that they have become a danger to the very fabric of the greatest Sovereign, Socialist, Secular and the Democratic Republic. While the very Preamble of Indian Constitution declares liberty, equality, and fraternity as its ideals; assures Social, Economic and Political Justice to the citizens of India; offers Liberty of Thought, expression, belief, faith, and worship; provides equality of status and opportunity to all the people; and strives to promote fraternity among all the citizens, the Central Government that follows the Hindutva supremacist ideology seems to have consciously discounted all these stated in this Preamble. Pro-Corporate and Unkind to the Poor: Further, in nexus with the Corporates and the Multi-National Companies, the poor are being plundered. The cry of millions of poor farmers to waive their loans off falls upon the deaf ears of a Government that happily waives off loans owed by 50 rich people. The Government has failed in availing loan waivers, Minimum Support Price for agricultural produce and financial help to the impoverished farmers. The increasing number of farmer suicides is a clear proof how these economic reforms have largely failed the farmers. One cannot forget the long march, embarked by 35, 000 farmers walking on barefoot from Nasik to Azad Maidan covering 180kms from 2018 March 6th to 12th, by agitating farmers that included the Tribals, demanding implementation of Forest Land Rights Act 2006 and the Land tillers (not owners) who have no institutional credit to their name. Economic distress, joblessness, price rise, especially of Petrol, Diesel and LPG are ebbing life out of the poor citizens and the Government seems to be least interested. The Government Policies like ‘Demonetization’ and GST have ruthlessly affected the poor. The charges of corruption and reports about scams and scandals are flying thick and fast the same. There is no doubt that the Government is pro-corporate and unkind to the poor. Endangering the Democratic and Secular Fabric: The roles of state, envisioned by the founding parents of India – a pluralistic nation, were to protect and preserve the rights of all faiths, especially those of the religious minorities. But today, for the Central Government there is a fundamentally different agenda that is in line with their notion of nation – Hindu rashtra. Towards the fulfillment of this agenda, the government is in the process of changing the school textbooks, inserting dogmatic and pseudo-scientific religious content, banning films, books, festivals of minorities etc, which they claim to “offend” the Hindu nationalist sentiments. The demolishing of Churches and Mosques, vandalizing of Statues and persecution of people belonging to Christianity and Islam show the true face of BJP that subscribe to the Hindutva Ideology. While I consider Hindus as my own sisters and brothers, I believe Hindutva which is totally against the values of Hinduism is a danger to the age old religious fraternity that this nation upholds. The communalist and fascist ideology of Hindutva promoted by the ruling BJP, cast a shadow over the constitutional secularism, and the religious minorities live under threat. The Church of South India demands that the Government at the centre ensures the democratic and secular fabric of India to be safeguarded. Unleashing Atrocities against Dalits and the Tribals: There is a huge ‘blue wave’ happening across the country, with Dalits agitating against alleged “dilution” of the Scheduled Castes (SC) and Scheduled Tribes (ST) (Prevention of Atrocities) Act 1989 that bans automatic arrests and registration of criminal cases under the legislation which seeks to protect members of scheduled castes and tribes against discrimination and abuse. Many who took to the streets on April 02, 2018 to protest the Supreme Court’s decision have been booked and several people have been killed and this shows the ‘anti-dalit’ face of the BJP. In fact, many dalits are every day being tortured, raped and brutally murdered by the Hindutva extremist forces. Also, Hindutva’s obsession for the cow and its progeny has not only deprived the Dalits of a cheap source of protein but also has severely affected the economy of lakhs of them who are marginal farmers and cattle breeders. In such a context, the Dalit outreach by the BJP and the construction of statue for Dr. B. R. Ambedkar can only be seen as their political and ideological agenda of appeasement. 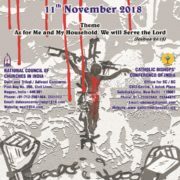 Therefore, the chain of recent agitations indicates a new Dalit awakening and the Church of South India not only stands in solidarity with the Dalits fighting for justice and equality but also condemns all atrocities against the Dalits. 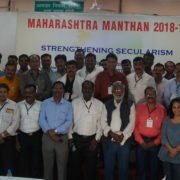 Further, the Church of South India also strongly demands that recommendations of the Ranganath Mishra Commission and the Sachar Committee for reservation to Dalits of Christian and Muslim minority communities be implemented. Conclusion: I very well know that activists, intellectuals and many others who voice against the corporate-fascist ideology are being silenced and even murdered. But, I believe as a citizen of India and as a disciple of Christ, it is my role too to warn my fellow citizens against the fatal danger posed by the Hindutva forces in nexus with the corporate. On this day on April 06, 1930, at the end of the ‘Salt March’, Mahatma Gandhi raised a lump of mud and salt and declared, “With this, I am shaking the foundations of the British Empire”. Today, on April 06, 2018, I urge you to unite, irrespective of your religion, caste, class, creed, colour, language and gender, and shake the foundations of this new empire being built by the Corporate-Fascists, so that our nation remains a Sovereign, Socialist, Secular and the Democratic Republic . 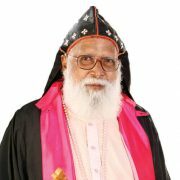 Moderator, Church of South India. Rev. 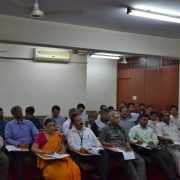 Sunil Raj Philip – Director, Departments of Communication, Dalit and Adivasi Concerns, Church of South India (CSI) Synod. http://ncci1914.com/wp-content/uploads/2018/04/envelope.png 600 600 Caesar David http://ncci1914.com/wp-content/uploads/2018/05/NCCILOGO105-300x72.png Caesar David2018-04-09 13:10:142018-04-09 13:14:30An Open Letter from Bishop Most Revd Thomas K. Oommen (Moderator, Church of South India) to the Fellow Citizens of India.